Jenny’s Cakes strives to provide exceptional service to our couples. 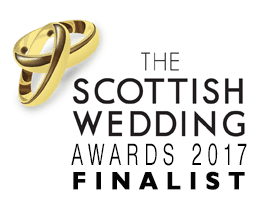 We are delighted to have been nominated for a VOWS Award (for Wedding Cake Designer/Baker) for THREE Years in succession. 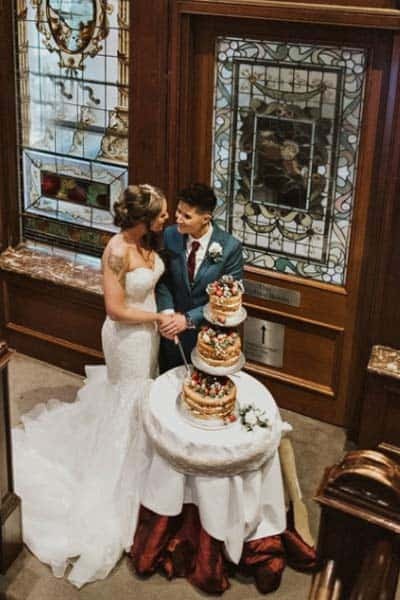 Please read some recent Wedding Cake Reviews from our Brides and Grooms, with cutting-the-cake photos below. There is also a compilation Video of Wedding Cake Reviews below, with feedback on our wedding cakes over the last year or two. We look forward to hearing from you soon- Please Check Our Availability for Your Wedding Date Now! With best wishes, Tom and Jenny, Directors of Jenny’s Cakes. Client Feedback is so important to us at Jenny’s Cakes. We are Very proud of our 5 Star Customer Rating on Facebook. 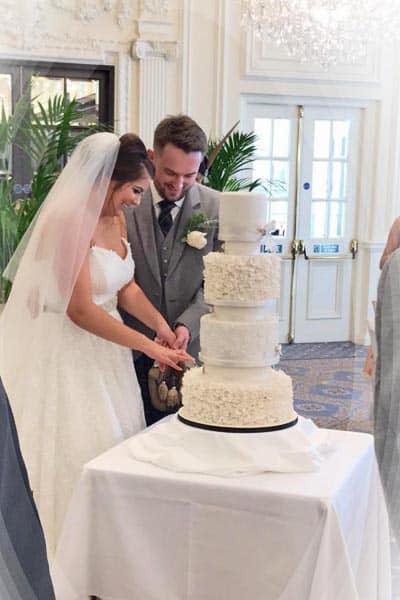 Each wedding cake is made to order, to each couple’s wishes, so it’s a great thrill when we get a thank-you card or (even better) a ‘Cutting the Cake’ photo and some words of encouragement! Please see below a video and some recent reviews from happy couples who have entrusted us with creating their wedding cake. 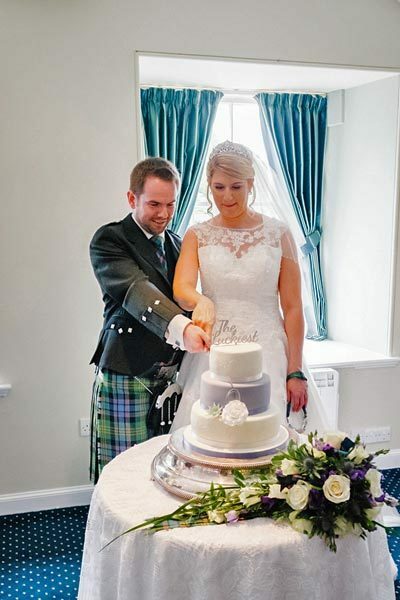 Gemma and Martin Cutting their Wedding Cake at Carlowrie Castle in Kirkliston. Just a wee pic to keep you going till I get a proper professional one to send to you. We truly had the most special and beautiful day filled with love, laughter and dancing. The cake drew so many gasps ….. it was simple elegance standing in the room. We can’t thank you enough for your professionalism, talent and strength …. it was a heavy one …. and to top it off apart from 6 pieces it was all gone during the day. I call that a result!! We visited Jenny and Tom at the bakery for a tea and taster consultation. 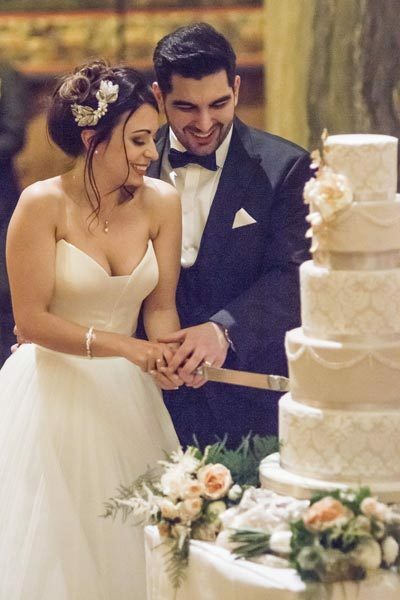 Their cakes are works of art and it was instantly evident that Jenny and Tom love what they do and that their cakes are made with love, passion and an absolute wealth of experience. Jenny and Tom were interested in us as a couple and in our journey, and what we envisaged for our big day. We really enjoyed chatting with Jenny and Tom in their beautiful bakery, and got to sample some lovely gluten free cake. My wife and I are both gluten free but this was no trouble at all for Jenny and Tom. We had no need to go home and think things over- we knew instantly that we had found the people who we wanted to make our wedding cake. Jenny and Tom are lovely, warm, friendly, professional and efficient. 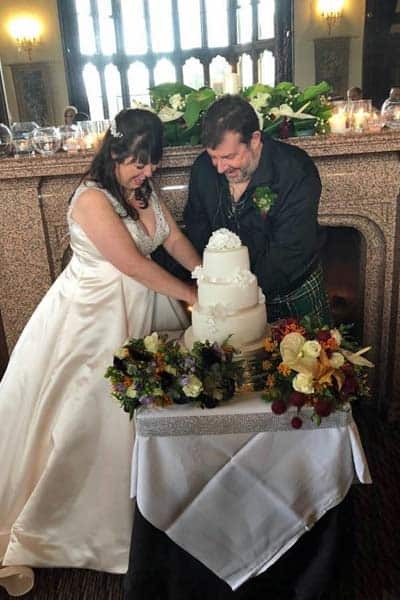 The service was outstanding from start to finish and we would have no hesitation in recommending Jenny’s Cakes to anyone who is looking for a beautifully constructed and delicious tasting cake. Thank you Jenny and Tom- you are fabulous! The cake tasted delicious, we loved how you were able to take our vision, give input to it, and make it a reality. Everyone on the day commented how fantastic the cake tasted! We loved our ‘Tea and Tasters’ condsultation at the bakery- it felt we were having tea and cake with friends. You both were fantastic! Jenny and Tom met us at the tea and tasters session and made us all feel so comfortable. All of the tasters were so delicious we knew straight away we wanted Jenny’s Cakes to make our cake. Our wedding cake was the most amazing cake ever the detail and taste of the cake was exceptional! We couldn’t have asked for anything better!! Jenny and Tom are so lovely and listened to our ideas and brought our dream cake to life! 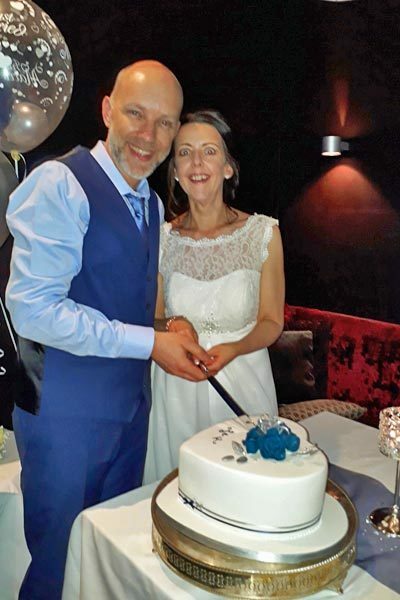 Cutting the Wedding Cake Photo - Karen and John at Smiths Hotel Gretna Green. We ordered our cake over the phone, as we live in England and too far to visit the bakery. We had excellent customer service from our first e-mail to our wedding at Smiths in Gretna. Our cake was also gluten-free and very tasty! Cutting the Wedding Cake Photo Karen and John at Smiths Hotel Gretna Green. The wedding cake that Jenny’s Cakes made for us was absolutely beautiful and tasted wonderful. We had plenty of compliments from our guests. We appreciated meeting Jenny and Tom at their bakery to discuss our cake ideas- it was a lovely experience getting to know you both and understanding how you work. Thanks again, Julie and Rodger. We were over the moon with the cake you made for us. It looked absolutely stunning and was even better than we had imagined. It tied in perfectly with our theme, colours and even my dress! We loved our afternoon tea, it gave us a great idea of the flavours we liked. Looking at the example cake designs also helped give us an idea of the look we wanted. Thank you again for our stunning cake and helping to make our big day perfect! 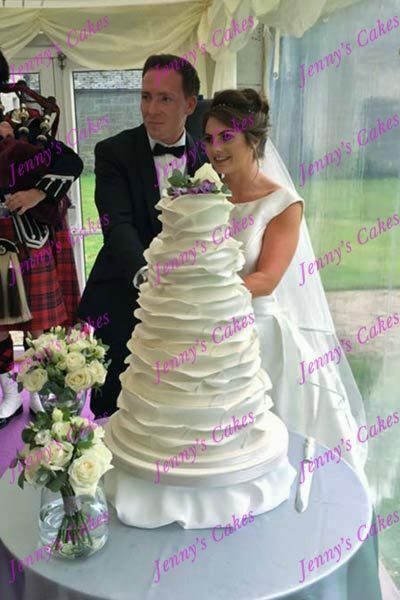 We hope you enjoy seeing what some of our clients say about working with Jenny’s Cakes. 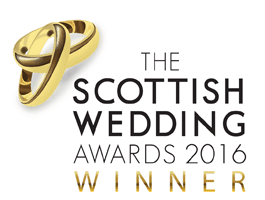 We hope that these reviews will inspire you, and help you to visualise your big day! Please Check Our Availability for Your Wedding Date Now!